Upon entering the venue, sublet from the Xanadu Hotel, we were surprised by the starkness of the décor. The grey stone walls and minimalist angular tables and chairs, were only accented by a few traditional wooden medicine cabinets and one wall lined with Terracotta warriors on the far end. The décor certainly matches well the restaurant’s name, 石库门, literally “stone warehouse gate”, an architecture style representative of old Shanghai houses, typified by the round stone gate, present in the restaurant’s logo. Running late, we had lost our booking, but the staff managed to seat us relatively quickly. Settling ourselves down, we started with the tea menu, which is as telling as a wine list. Shikumen’s is select but sound, organising teas by region, as well as the type. Though I was disappointed, and surprised, that they had run out of Da Hong Pao Wulong, I was happy with the solid taste and full body of my camphor scented Yunnan Pu’Er, and my colleague enjoyed his Anxi Tie Yuan Yin with its honey suckle scent and grassy after taste. Our selection has become one of process now, a few stock dishes as a control, a couple of reccomendations, topped up by what we personally like the look of. 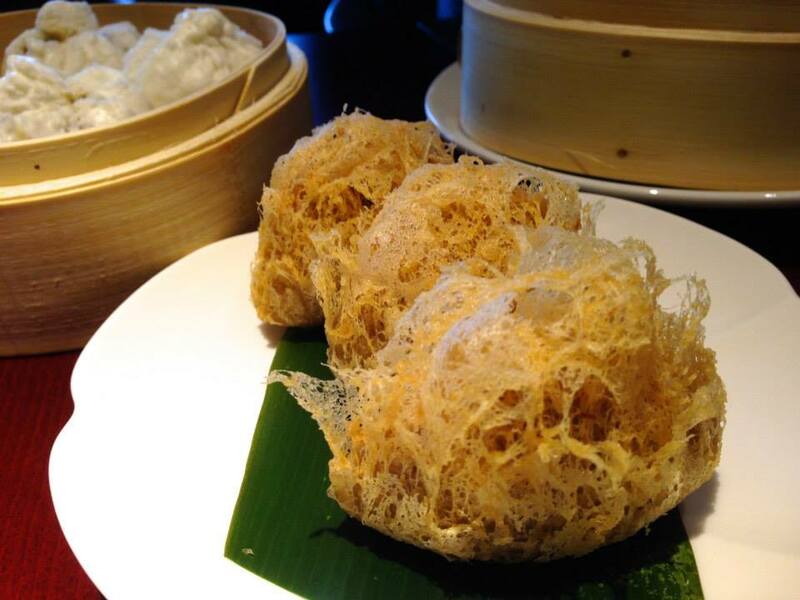 We were recommended the Xiao Long Bao, a very typical Shanghai bun, which probably found its way onto the Cantonese dim sum menu with the large number of Shanghai migrants to Hong Kong during the early 20th century. I’ve found mixed results ordering it in London, many examples didn’t even contain soup, an important feature of this dish. 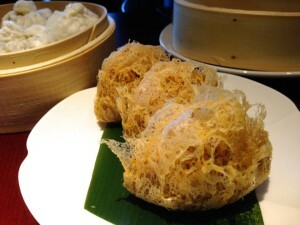 There is no question to the quality of Shikumen’s Xiao Long Bao, home dish of its Shanghai chef, with a unique and bright flavour to the soup, and skins which held it well. Of the standard fare, We ordered the Har Gao (prawn dumplings), which were well cooked but not over-steamed, with a nice firm and chewy texture. The Siu Mai (pork and prawn dumpling) were solid, well-packed and tasty when accompanied by black vinegar, which was also provided the moment the dish arrived. The salty and hot taste of the Chicken Claws in Chilli Black Bean Sauce did leave us wanting a more complex flavour, the texture though, was perfect, and just right for the mouth to take every morsel from the bones. The Char Siu Bao were nice and fluffy, with the dough well risen, and steamed to perfection, though the contents were a rather lurid orange, the meat cut finely with little texture, the overall affect being not dissimilar to a savoury jam dohnut. The Chicken Taro Croquettes were rather delicious. A tempura explosion on the outside, pleasing to the eye, and solidly crunchy to bite into, contrasting with the velvet-creamed taro centre, with the Xian (Umami) taste of the mushrooms really coming through. I also indulged in a bowl of the Century Egg and Pork Congee. They certainly don’t skimp on preserved eggs, or pork. It tasted hearty, and warming, just as it should, though not as good as my grandma made it, but can any ever? The diversity of the dishes available at Shikumen is of course a sign of the owner’s obvious pride in their heritage. There were quite a few specialities from Shanghai, and for those who find northern fried dumplings too stodgy, the Shanghai Guo Tie (pot stickers) provide a lighter alternative, the skins being made of very thin, soft dough and the inside subtly flavoured with a moist stuffing, more akin to steamed dumplings. Shikumen may be the few places in London that offer the Tianjin Goubouli* Bun. The buns were lightly fried, very soft and fluffy, with a delicate vegetable based stuffing. I must admit we tucked into our buns before counting off the 18 pleats the buns sport as a mark of authenticity. The squared off steamer baskets are a testament to the designer’s effort to unify the restaurant’s style, though the practicality of separating them when they are piled up together has definitely been compromised. The mix of Chinese and Eastern European staff were all smiley, friendly and came over more than once to refill our tea, and it was great to see a big Chinese family having their Sunday lunch together on the next table. Sharing landlords with the adjoining Xanadu Hotels means that Shikumen opens at 7am rather the customary afternoon hours of British restaurants, but only to serve a western breakfast to the hotel’s patrons. Dim sum restaurants in southern China open around 6am to receive their early morning custom and don’t serve dim sums much beyond eleven. It was a very busy Sunday afternoon and Manager Peter could only get away to speak with us towards the end of our meal. Shikumen has been open since August this year, they have a still larger branch in Shepherd’s Bush, and the ambition to set up all over the UK, including the highest end luxury dining around Chelsea. Despite the apparent popularity of the Ealing branch, Peter is anxious to increase the profile of Shikumen, a lack of complacency that indicates that the business will go far. I am impressed by Shikumen’s step away from the cheap and cheerful, greasy and MSG saturated image of British Chinese food to handmade dim sums, and dishes such as their carefully prepared Soft Shell Crab in Almond Butter Sauce, and Braised Chicken with Radish and Sweet Basil. 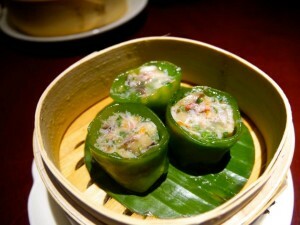 It’s elegant Chinese dining with a touch of creativity, without straying from the integrity of the dishes. Shikumen’s delight in “pairing the very best of British product with Chinese saucing, garnish and taste” sounds to me like a recipe for success, as long as prices don’t increase so much that the average diner would no longer be able to consider the venue in the context of “a nice treat out”, which is exactly where it belongs. *Literally “Dog Doesn’t Answer”, named after its 19th century creator, whose nickname was “Dog”. He became so obsessed with creating and selling the perfect buns on the streets that when his neighbours called out to him, he no longer answered.